The information in this post is still valid, even for Joomla 3.6.4 and up! What is the Joomla! HTTP Error 500? Unfortunately this Joomla! HTTP Error 500: Internal Server Error has nothing important to tell, except Internal Server Error, The data is invalid. (0x8007000d) on IIS. It basically means that somewhere the output breaks FastCgi and PHP output. 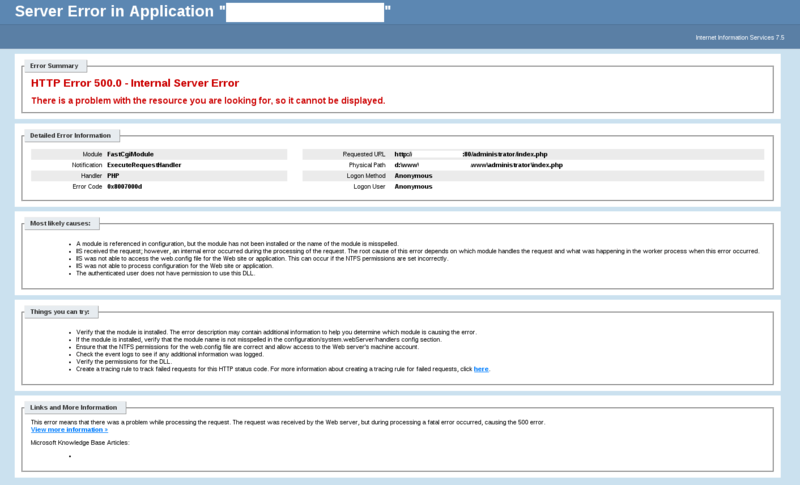 Often, you can fix this HTTP error 500 in Joomla pretty easy. If only I knew this earlier, it would have saved me some time 🙂 . This post certainly will save you time. when you’ve tried to log on and the HTTP 500.0 error is displayed, add ?option=com_installer&view=database in the address bar of your browser to the URL. The full URL then becomes http://www.example.com/administrator/index.php?option=com_installer&view=database. after pressing the ENTER key on your keyboard, you’re automatically logged on to your Joomla! 3.2.0 administrator back-end. Curious to learn how to optimize Joomla with just 8 simple tips? This fix for HTTP 500 errors during log-on to Joomla administrator is still valid for Joomla 3.2.4, 3.3.6 and Joomla 3.6.4 updates. Turns out, at least on Windows Server IIS, PHP/FastCgiModule might throw this 0x8007000d error if file and directory permissions are improperly (incorrectly) configured. You have to correct that as well. Database schema version (3.1.1) does not match CMS version (3.3.6-2014-09-30). Database update version (None) does not match CMS version (3.3.6). Doesn’t help unfortunately. The login dialogue box still appears and the HTTP 500 error then aoccurs. Thank you for your comment. I’ve tested this with an update to Joomla 3.2.4 and this still works. Yep, fixed my issue too, thanks!! Thank you. it works for me. You are great.